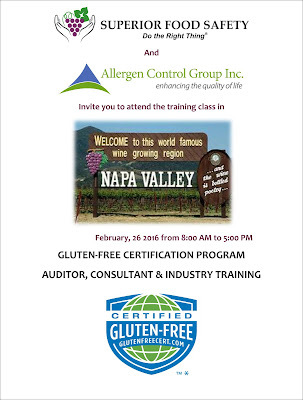 Register Today for GFCP - Gluten Free Certification Program on February 26th - Don't Miss Our Early Bird Rates! Early Bird Approved GFCP Auditor Training - Save $30 – $615.00 (USD) This ticket is for those intending to audit in the GFCP and sit for the exam portion of the training session. Early Bird GFCP Implementation Training - Save $30 – $465.00 (USD) This ticket should be purchased if you are not pursuing an Approved GFCP Auditor Designation for third party purposes. The Allergen Control Group in Association with Superior Food Safety will conduct a one-day Gluten-Free Certification Program (GFCP) training session for Food Safety and Quality Assurance Managers, Purchasing Managers, Supply Chain Personnel (from Industry), Experienced Food Safety Auditors, Food Safety & Quality Assurance Consultants, Internal Food Auditors and Food Safety Trainers wishing to learn more about implementing and auditing in the Program. Those interested in learning about the production complexities, government regulations and the required customer compliances, associated with producing food products with a gluten-free claim on the label will find this course beneficial. Managing gluten as a chemical hazard and the many hidden sources throughout the manufacturing process, will go a long way to informing those attending this course to better understand how to prepare for or conduct a meaningful gluten-free audit. Pre-screened and qualified Auditors will be asked to complete a final exam in order to receive an Approved GFCP Auditor Designation. · What is celiac disease and non-celiac gluten sensitivity? 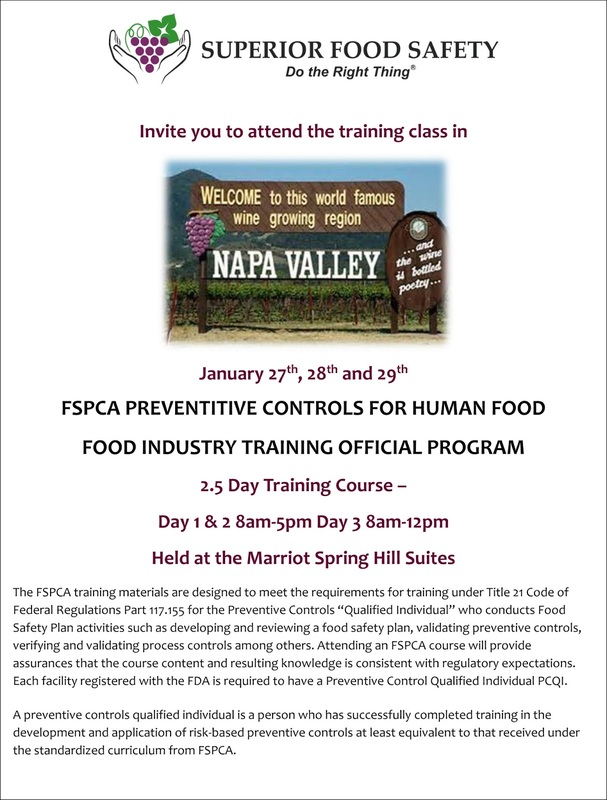 The Date for FSPCA Preventative Controls For Human Food has Changed - Early Bird Ends February 19th! Pricing is for 1 attendee, additional guests/attendees can be added at the same discounted rate in registration process. The FSPCA program is based on collaboration among federal and state regulatory officials (FDA), academic food safety researchers and educators, and U.S. food industry representatives. This program is delivered by a certified Lead Instructor by the FSPCA. The FDA Food Safety Modernization Act, or FSMA, is designed to create a higher standard for the processing and manufacturing of food from domestic and international distributors. Businesses that sell foods directly to consumers, such as small farms and restaurants, are exempt from the required biennial registration. An amendment to the FSMA states that food manufacturers under a certain yearly revenue threshold will also be excluded from registration to prevent a negative growth impact on small business owners who enter the market. When registering with the Secretary, the contact person in a domestic business or an American agent of an international manufacturer must send the appropriate information. The main purpose of the registration is to grant the Secretary access to a facility for inspections deemed acceptable under the new FSMA. The abbreviated renewal process is applicable to businesses that have already completed their registration ensuring that the information is current. In order to register, businesses that are impacted under this law to pay a processing fee upon submission. Businesses that make over $500,000 annually will need to register with the government during the registration period. Renewal will not require a fee with registered facilities, and this amount is not expected to significantly impact large businesses. Most fees for the new FSMA will be associated with multiple inspections, failure to adhere to recall orders, and other administrative costs. If there are any problems with the registration, a temporary suspension of distributions may occur depending upon the level of discrepancy. Since it will be mandatory to have valid registration to distribute food to or from the United States, lapses in communication should be avoided by having a sufficient amount of contact information. The deadline for registration during each even numbered year is between the beginning of October and the last day of December. This allows an entire quarter for a business to update its registration and contact information every two years to prevent any missed notices from the FDA. Failure to register with the Secretary while distributing food may result in a maximum penalty of ten years in a federal prison. Distributing food after a manufacturer has received notice of suspension may also result in repercussions, and any food seized may be destroyed at the behest of appropriate officials. These severe punishments are designed to encourage businesses to follow the code of this legislation and protect the safety of United States citizens from foodborne illness or death. Once registration is suspended, the manufacturer will call for an informal meeting with officials to determine the extent of the problem. If the cause of the initial suspension still exists at the time of this meeting, the suspension will be indefinite until the manufacturer corrects the circumstances to fit the legislation requirements. The manufacturer must present a plan of action showing the increase in quality and safety of their product over a period of time. To reactivate the registration, officials will inspect the facility to ensure the operations meet the guidelines stated in the FSMA. 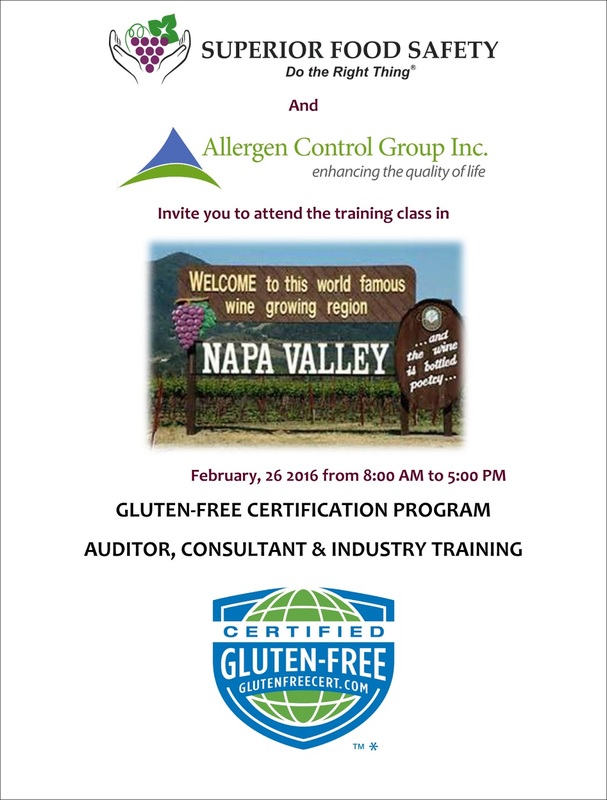 GFCP - Gluten Free Certification Program on February 26th - Don't Miss Our Early Bird Rates! Recent events have shown that in an increasingly globalized food production environment, food safety has emerged as a vital public issue. 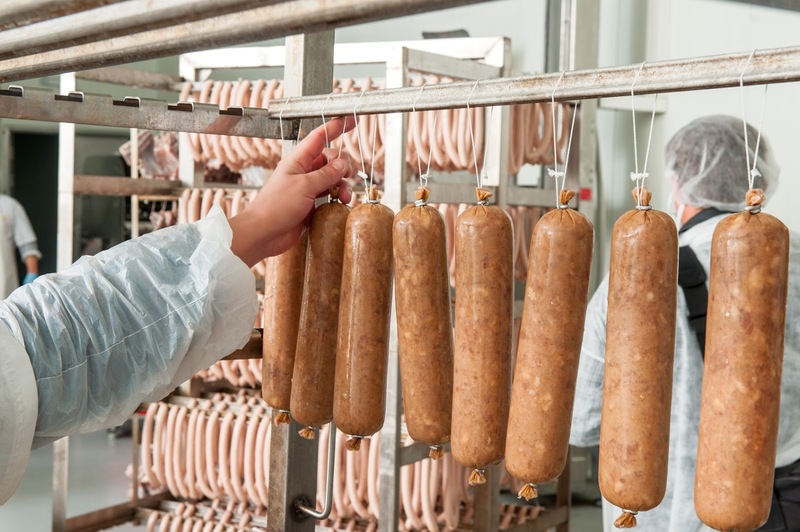 Food manufacturers are increasingly under scrutiny both from governments and consumers regarding their production methods, quality practices and commitment to product safety. One of the cornerstones of a strong food safety management system is HACCP. The seventh HACCP principle focuses on setting up record keeping and documentation procedures to ensure compliance with food safety regulatory requirements. For the successful implementation of HACCP, appropriate documentation and records must be kept and be readily available. This article describes some of the record keeping best practices that will help food manufacturers ensure compliance with HACCP requirements related to food safety management systems. The Hazard Analysis and Critical Control Point (HACCP) system is a systematic approach to identify, assess and control of hazards in the food production process. HACCP is a seven step process that monitors the performance of food safety management systems. The records maintained for an HACCP system should include a summary of the hazard analysis, including the rationale for determining hazards and control measures. The purpose of the hazard analysis is to develop a list of hazards which are likely to cause injury or illness if not effectively controlled. Under record keeping requirements of HACCP principles, the use of electronic records is acceptable, provided that appropriate controls are implemented to ensure the integrity of the electronic data and signatures. The HACCP principle of establishing record keeping procedures require that records such as CCP monitoring records, corrective action records and verification records must be reviewed on a routine basis. The HACCP team must comply with regulatory requirements for review of HACCP records. · Must be reviewed within seven days of generation of the original record. 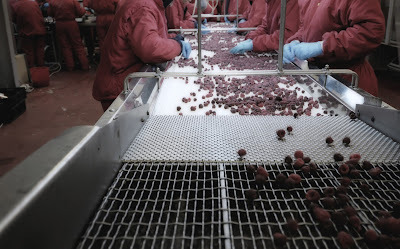 · The U.S. Department of Agriculture requires a review of HACCP records prior to shipment of any finished products. This is often referred to as the "pre-shipment review." · Two years or shelf life of the product (whichever is greater) for frozen, preserved, or shelf-stable products. 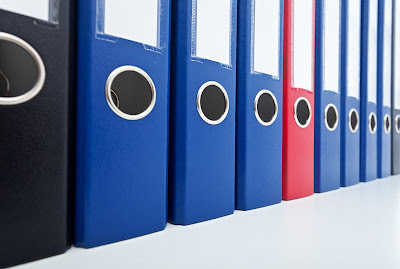 · Offsite storage of records required is permitted after six months following the date that the monitoring occurred, if such records can be retrieved and provided onsite within 24 hours of request for official review. 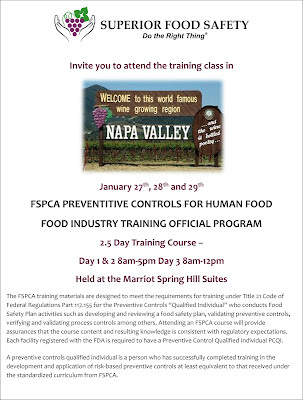 FSPCA - Preventative Controls For Human Food Training Class is January 27th - 29th - Register Today! HACCP (Hazard Analysis Critical Control Points) is a proactive approach to food safety that involves identifying points in the process of producing or manufacturing food that are critical to food safety. A key stage in the preparation of the HACCP documentation is the Terms of Reference document. To this day, many companies still don't spend enough time or effort on this document and yet it is the very foundation of the HACCP system. This article will explain why this is important and discuss the key elements of creating a good terms of reference document. 1. Product / Process Details - this is a description of what we are going to be producing, manufacturing or preparing. It should, in effect, be a description of the process flow diagram in such a way that you could actually draw up a process flow diagram from it. This means that there should be sufficient detail to be able to draw the process flow boxes on paper and connect them up to form the process flow diagram. A good way to do this is to describe exactly how the product is made, what ingredients go into it, how ingredients and packaging are stored and processed. Ensure that this is described in sequence from start to finish. This section should also state what products or product groups are covered by this HACCP plan. 2. Scope of Hazards - here we outline the types and nature of the hazards that are to be assessed in the hazard analysis. For example; in a meat processing operation this will typically say 'This HACCP plan is concerned with microbial, chemical and physical hazards. The main hazards that are likely to cause a problem are microbes such as E.Coli, coliforms and salmonella.' You would then go on to describe the main ways in which these microbes can cause problems in the process. For example cross contamination, inadequate cooking or cooling. 4. Product Specification - here we want to include the relevant details of what is in the product or its recipe. If we have a separate detailed product specification document then we can simply provide a reference to that document. 5. Intended Use - this is a very important part of the Terms of Reference document as it describes who the finished product is intended for consumption by. This section should mention any susceptible groups such as the elderly, infants, pregnant mothers or allergen sufferers. If there are any such susceptible consumers of the product then these must be take in to account during the risk assessment part of the hazard analysis. This section will remind the HACCP team of this. 6. HACCP Team - finally; the HACCP team itself for the product being studied must be documented. Here we need to outline the roles, responsibilities, training and experience of the HACCP team. For example, we will need a HACCP chairman or coordinator who will make final decisions in the event of disagreement and who will keep progress moving forward. We may also need a HACCP Secretary to take notes and minutes. We will definitely need people who can do the practical work of writing up and verifying process flows and then those who are responsible for day to day running of the system as well as training. As you can see there is more to the Terms of Reference than meets the eye so it is important to get this document correct from the start. Errors and omissions at this stage of the HACCP plan represent the thin end of the wedge and can become major issues that affect food safety later in the HACCP documentation process.